For some reason, everyone always talks about how long it takes for people to see the scar if you have a FUT. It seems as though, from what I’ve read searching through this site and others, it’s rarely mentioned, how long the “implanted” hairs are seen. In other words, if you get a FUE, and you have a decent amount of hair on sides/back… how long will it take for the redness… to go away on top, once the transplanted hairs are implanted? My question has to do with work. I’m considering a HT, and I’m curious (since I work in business and you cant wear caps) how long it would take for me to go back without wearing any cover-up. Basically, on average (cause I know everyone is different) how long it takes for that skin to heal where it’s not evident to someone your talking to in person. Everyone does heal differently. For me I had no redness and very little sign of surgery 10 days after my procedure. At 14 days it looked like I just had a shaved or buzzed head, I had no scabbing or reddness. But for many it is longer then this. If you cannot wear a hat to work I would say you want 2-3 weeks off from work. Even at that point you may have little redness. A good excuse if you have your procedure in the sumemr time would be to tell people you got a sunburn on your head. 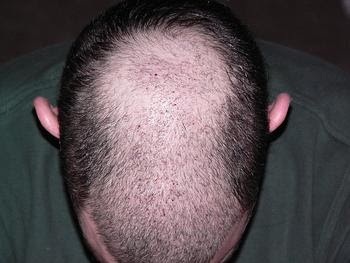 Following link shows an example of what the recipient area looks like after 1, 2, 3, 4, 5, 6 and 8 months after hair transplant. Please remember, there will be individual differences in terms of healing post ht redness and hair growth.